We just finished up the Heavy Gear Arena cover artwork, so I wanted to post it up for everyone to see. I'll also put a small promo text below the picture, that we prepared for a flyer we were giving out at Gen Con this summer, enjoy. What is Arena? It's in your face! It's multi-ton robots trashing each other! It's all about drama on the field and off the field! This isn't your slow paced hack fest! This is Gears kicking tail and taking names! Hire the best. Kit your Gears. Slug it out with the best. Only one team can rise to the top, but do you have what it takes to win? Heavy Gear Arena is a fast paced, highly customizable tactical battle game set in the award winning Heavy Gear setting. For centuries, Terra Nova's best pilots have taken their Gears, advanced robotic fighting machines, and pitted them against each other in the world of sports dueling. Only the best stay in the games and earn their legendary reputations. Of course, reputations only get you so far. Winning equals’ money for upgrading your team and its equipment, the support of your adoring fans brings fame and more importantly the corporate sponsors, or just the thrills, pilots come from all over to find the thing they're desperate for in Khayr ad-Din. Take on the role of team manager and build up your team to pit against the competition. Along with lots of new Heavy Gear Arena Miniatures (compatible with Heavy Gear Blitz! ), Duelist Weapons Upgrade Pack and Heavy Gear Arena Sponsors Decals Pack. 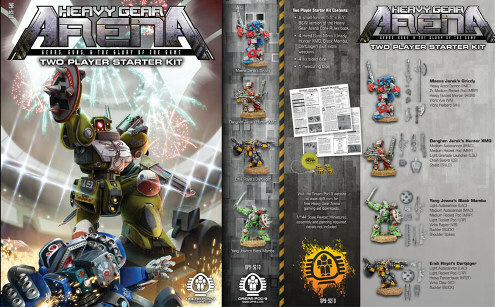 Check out Robot Viking to win a copy of the new Heavy Gear Arena Two-Player Starter Set and a copy of Operation: Drop Bears Dive! Then read Robot Viking's review of Heavy Gear Arena and grab some exclusive Heavy Gear Arena desktop wallpapers. Hugh! They are awesome. I already read some comments about it on a different forum. I will definitely be picking up that 2-player starter kit in the summer. It looks like a lot of fun! Got my starter set this weekend, it is awesome! The 4 Gears you get come with tons of weapons and equipment options. Gotta give the book a full read through before I decide what goes on who, but then again I might end up magnetizing everything. More Dakka wrote: Gotta give the book a full read through before I decide what goes on who, but then again I might end up magnetizing everything. I tried; I found it pretty much impossible. The only magnets that are small enough to fit in the Gears' hands are the 1/16" dia. x 1/32" thick ones, and they aren't anywhere near strong enough to hold the metal weapons in place, particularly when you're looking at stuff like the HAC or MAC. Not to say don't try it, of course, just letting you know it didn't work for me.